Treetops Traditional make a large selection of wooden garages and workshops, but this is their most generously sized version. 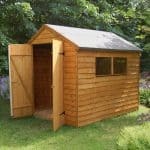 For this reason it’s ideal for those who have larger vehicles such as a 4X4, or even for people who want a building they can use as a garage some of the time but as a workshop or large storage space. It’s this versatility that makes this garage stand out from the crowd, and yet it still has the same high quality and attention to detail that we’ve come to expect from this brand. You may not think that windows are important for a garage, but if you want to use it as a workshop then natural light becomes a vital commodity. That’s why we were pleased to see three windows that let light flood in, and with one of them opening it also means that ventilation can easily be facilitated. The doors, too, are impressive as you not only get the very large double doors at the front but a single access door at the side. Perhaps the most impressive feature of all, however, is the high quality cladding used across all the surfaces. With the tall apex roof also helping to channel water away it means that you won’t have to be concerned about keeping the contents dry. Whilst we appreciate the benefits that metal and vinyl garages can bring, especially in terms of retreatment schedules, we liked the traditional styling of this large timber apex roofed garage. It’s not only a very convenient and dry place to store your car, or to carry out a business or leisure activity, it can also become an attractive garden feature, especially if it’s painted or stained to prevent it fading to a silver colour over time. We instantly noticed how deep this garage is, which we feel provides added versatility. Just how accommodating it is can be judged from its external depth of 6.10m and its external width of 3.66m. When you consider that a typically sized car such as a Ford Focus has a width of under two metres and a depth of just over four metres, it can be seen that there’s lots of room still available. 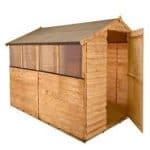 The tongue and groove apex roof, covered in a tough grey mineral felt, also produces lots of height, generating a ridge height of 2.74m and an eaves height of 1.85m. We were impressed by the dimensions of this wooden garage, but we were even more impressed by the cladding which sat upon its 44 X 44mm heavy duty frame. It’s made not of standard tongue and groove but rather of planed all round tongue and groove cladding. This makes it noticeably stronger and more rigid as well. It’s not the cheapest cladding option, but we welcomed the indication of quality. Being a garage, there is no floor included here, but we liked the fact that there is a base rail upon which a sound board can be fitted for noise insulation purposes. So far we’ve talked about some of this garage’s many positive features, but on the warranty provision it fares less well. We’re used to seeing anti-rot guarantees in excess of a decade, but on this occasion it only lasts one year. This is the minimum period allowed, so it shows no generosity at all on the part of the manufacture. One reason the warranty period is so low is that the timbers have only been given a basic dip treatment. This means that the customer has to apply their own preservative treatment after six weeks and then after every year. We can imagine this becoming particularly laborious on a building of this size, but it’s essential that the schedule is adhered to. We were pleased to find that two sets of doors were included, and especially that the hinged double doors at the front were so accommodating with a width of 2.13m and a height of 1.88m. We feel the single side access door can prove especially useful, as it gives access to the rear area when a car is stored inside, thus allowing it to be used for other storage purposes. This building is surprisingly light and airy inside, and both of these are down to the set of three windows. They allow a lot of natural light in, but as the middle one can be opened and closed they also cooling air in. Another thing that we liked about the windows is that they feature toughened glass which, along with the fully braced nature of the doors, makes the building more secure. Unfortunately these are the only effective security measures, as whilst the double doors and single door both feature a padbolt, neither of them include a padlock itself. We highly recommend their purchase, but we feel that with a garage of this price it would be reasonable to expect them to be included. If security is of especial concern to you, then you’ll no doubt add padlocks and an alarm system. You may also want to take advantage of the fully boarded option, which means that there are no windows and therefore no way of opportune thieves being able to see if anything of value is kept inside. We were pleased to see that this customisation option is offered free of charge, and we also think that the option to turn one of the fixed windows into a second opening window is also reasonably priced at £31.99. Rather more expensive is the professional installation service, although even at a cost of over three hundred pounds we can imagine many busy customers taking advantage of it. We expected high quality components from this manufacturer, and we got them as demonstrated by the universal use of a high quality cladding. It’s a pity that the emphasis has been placed on the customer to retreat the timbers so frequently, as this could potentially compromise what could otherwise be a durable building. 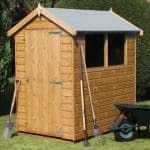 This is one of the larger timber garages that we’ve reviewed, and this makes it suitable for much more than simply storing a car. The manufacturer states that this garage can be erected by two people in around eight hours, but because of its size and complexity, we would recommend allowing up to two days for the process. 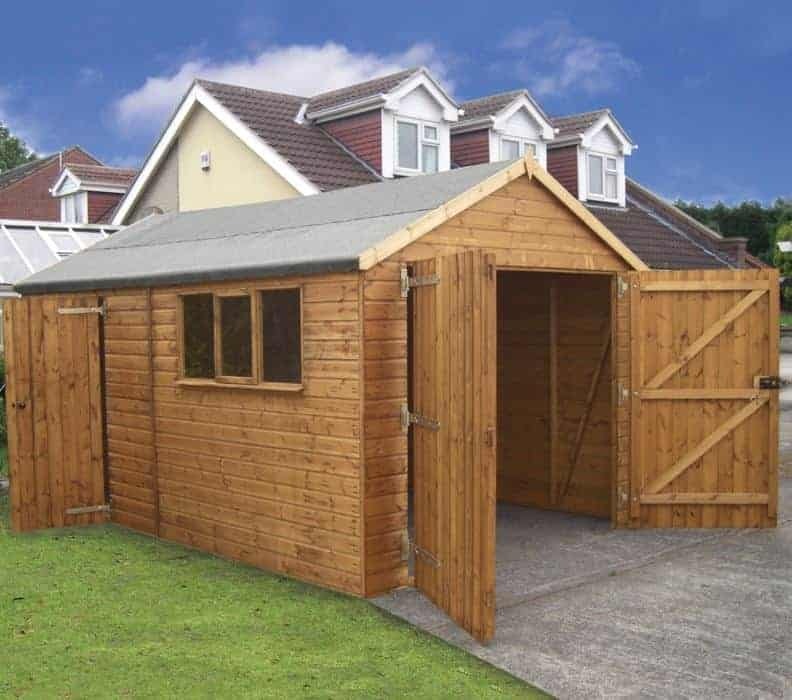 Whilst there are a lot of positives to this garage, such as its size and design, we wouldn’t be surprised if the price tag put some potential customers off. 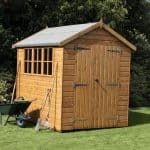 Final Thoughts: This is a wooden garage that would also make a very useful large scale garden shed or workshop. The main drawback to it is the requirement to retreat it every year, as well as just six weeks after installing it, but we know that some people find such tasks relaxing and even therapeutic. 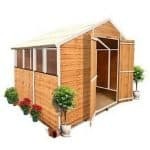 You’ll need a large and level area on which to install this building, but once it’s up it feels very strong so you won’t need to worry about wind, rain or snow. 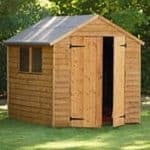 You can even use it as a security shed, with the addition of a pair of high quality padlocks, thanks for the option to have it without any windows.